All the oil headlines this week are rightly focused on prices spiking to the highest levels in more than two and a half years. But Brent moved up to nearly a $7-per-barrel premium over WTI, a spread that is also at a multiyear high. The wide differential could supercharge crude oil exports from the U.S., which have already recently broken all-time highs. Before the U.S. lifted the crude oil export ban at the end of 2015, WTI often traded at a significant discount to Brent. Much of that had to do with surplus supply trapped within the continent, as well as a shortage of pipeline capacity in certain areas of the U.S., meaning that surging shale output resulted in localized gluts. That spread just about disappeared over the course of 2015 and 2016, with the two benchmarks moving nearly in lock step. However, at the end of August 2017, Hurricane Harvey blew open the WTI-Brent spread once again, and the two benchmarks diverged. The renewed discount for WTI was the symptom of the massive refinery outages along the U.S. Gulf Coast, which led to a buildup in crude stocks as fewer refineries purchased oil for processing. The pricing differences are not expected to last forever, but for the time being, the spread between the two top oil benchmarks has remained open, even as most of the Gulf Coast refineries are back at full capacity. The result has been a surge in U.S. crude oil exports. Refiners from around the world – with China a particularly keen buyer – have scrambled to book shipments from the U.S. Gulf Coast. U.S. crude exports have spiked, jumping from around half a million barrels per day in 2016 and about 1 mb/d for much of 2017, to over 2 mb/d at the end of October, an all-time high. 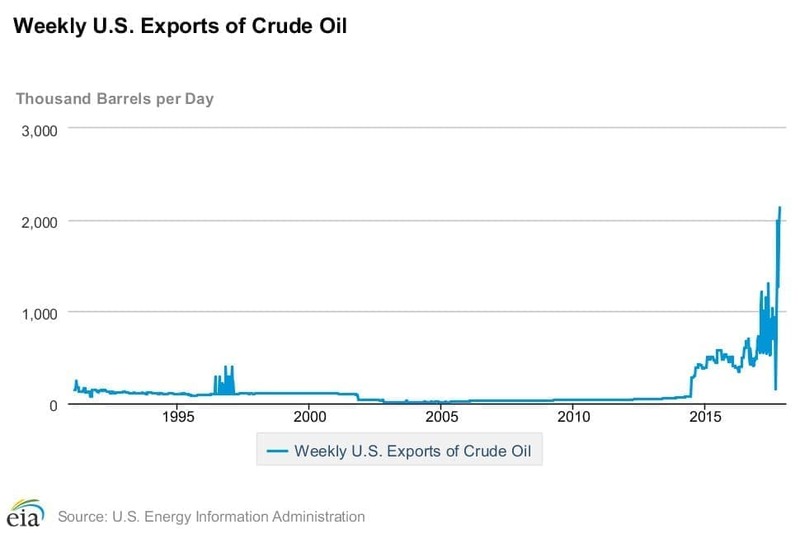 The flood of crude from U.S. shores has drastically cut into the net import total. Although crude net imports fluctuate quite a bit from week to week, they have largely stayed within a range of 6.5-7.5 mb/d for years. But over the past few weeks that total has plunged, dipping to 5.4 mb/d in the last week of October. It is unclear if this situation will last. But if the WTI-Brent spread were to open up wide enough, it would start to alter trade flows even within the United States. Back when WTI traded as much as $10 or $20 per barrel less than Brent (prior to 2015), huge volumes of crude were put on the nation’s railways, making their way around the country to different refineries. That was because refineries along the U.S. East Coast typically imported oil from abroad, but suddenly found crude from North Dakota, for example, cheaper than from West Africa (the result of the wide WTI-Brent spread). Even after accounting for the significantly higher transport cost, crude-by-rail became a competing option to imports. 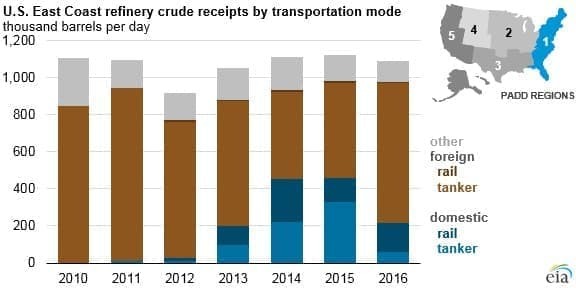 East Coast refineries went from sourcing virtually none of their crude purchases from domestic sources, to buying about half from U.S. producers in 2014-2015. In January 2014, East Coast refineries bought the same amount of oil from domestic source as they did from foreign ones, the first time that has occurred. However, once the WTI-Brent spread disappeared (again, when the crude oil export ban was lifted), East Coast refineries could no longer justify buying crude from North Dakota. They went back to buying oil from abroad. As of July 2017, East Coast refineries bought just 101,000 bpd from domestic suppliers. Moreover, East Coast refiners now have to compete with the rest of the world in purchasing U.S. crude. They may be technically closer to the drill site, but much of the oil will be flowing from Texas shale fields to the Gulf Coast. Once it hits the open sea, the East Coast doesn’t have much of an advantage over foreign buyers. Moreover, East Coast refiners have to buy shipments that are compliant with the Jones Act (i.e., the oil must travel on American ships), which adds to their cost. In short, East Coast refiners will likely stick with importing oil from abroad – these days it is increasingly coming from Iraq, for example. While rising shale supply won’t supplant oil imports for the East Coast, it will increasingly flow abroad as other countries by discounted American crude. The longevity of this situation depends entirely upon the WTI discount relative to Brent, which, for now, is sticking around.